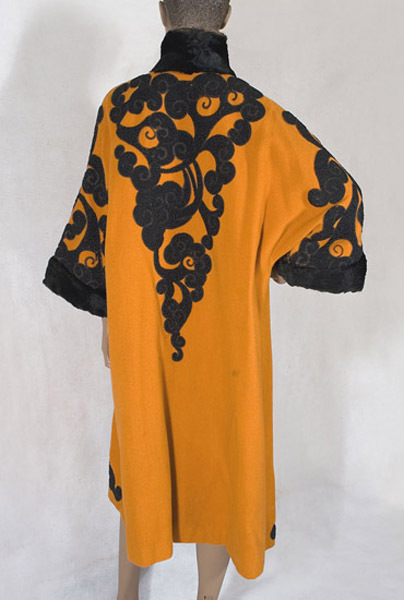 Before the early twentieth century, Oriental influence in fashion was confined to the design of textiles. The arrival of the Ballets Russes in Paris in 1909 detonated an aesthetic bombshell in the West. Decors for the ballet by Russian painter Leon Bakst used exotic patterns, brilliant colors, and lush fabrics. The new trend in all the graphic arts was termed Orientalism. 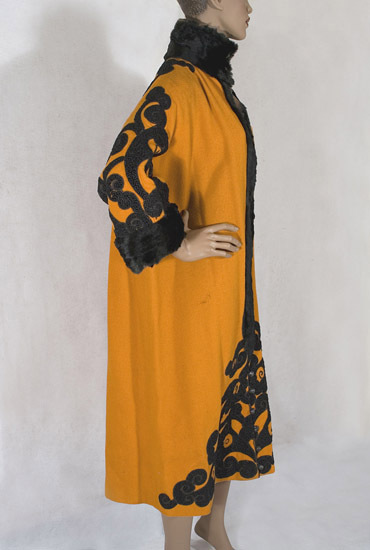 Made from orange corded wool and lined with black satin, this brilliant coat perfectly captures the mood of the period. 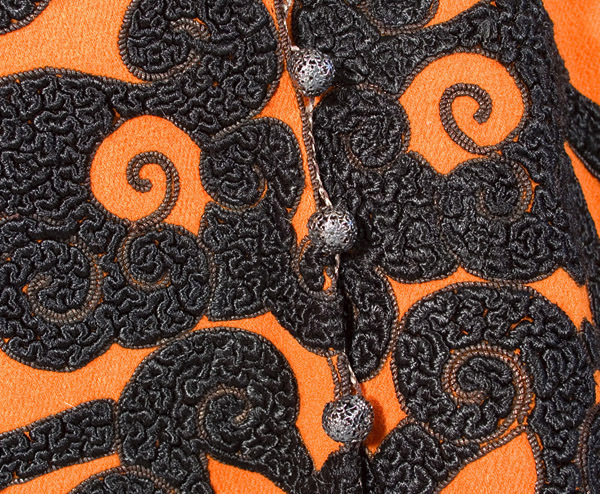 With its striking palette of orange, green and black. The craze for Orientalism that swept over Paris had widespread and long lasting effects. Because Paris was the epicenter of haute couture, Orientalism was soon exerting its influence on the entire fashion world. The collar, front opening, and cuffs are faced with green velvet. The collar, cuffs, and front opening are trimmed with black fur. 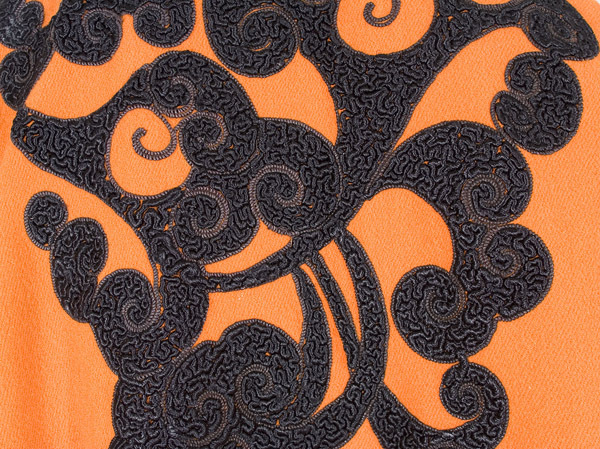 The black cloud-form pattern, borrowed from Chinese porcelain designs, is embroidered with curled wool yarn and outlined with black cord. 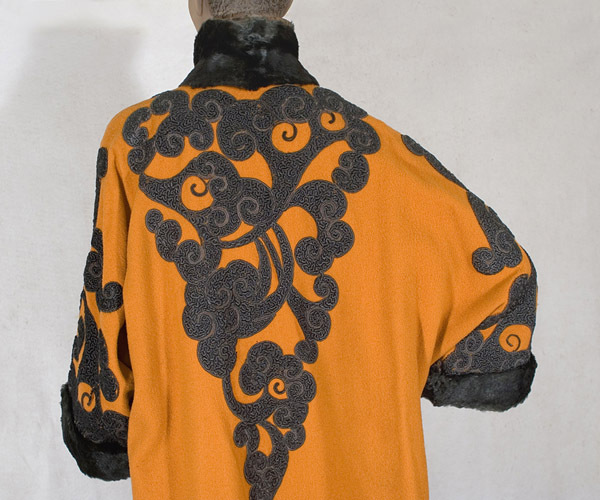 The briliant coat features wide kimono sleeves, a high stand-up collar, and a straight cut. 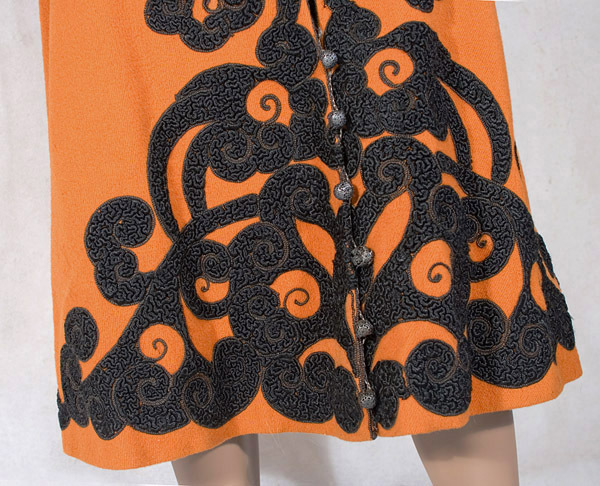 It closes at the neckline with hooks and at the lower skirt with cut-steel ball buttons. The corded trim that outlines the front opening forms the button loops. 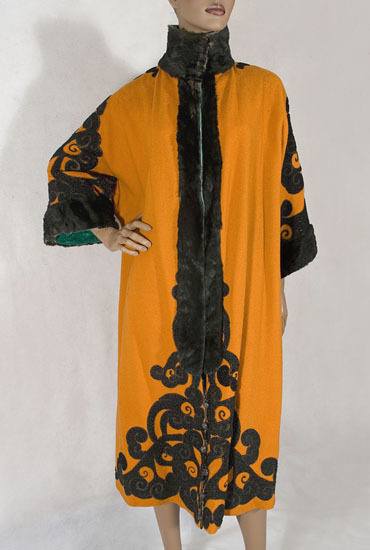 As exciting and wearable today as 100 years ago, this stunning coat is a peerless exemplar of Orientalism in fashion. The coat again proves what we have always known: style is individual, aristocratic, and reckless. The condition is almost excellent. 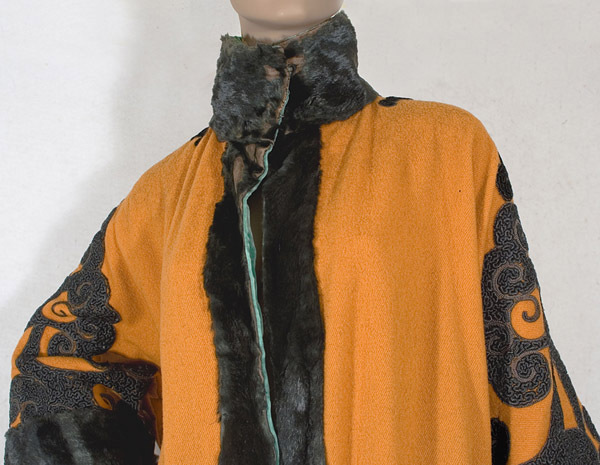 The fur on the collar and front opening is slightly worn. Luckily it is not shredding or disintegrating. Also, several ball buttons are somewhat flattened. I can overlook these minor flaws for such exceptional styling. It measures 58" around and 47" from shoulder to hem.